One of the perks (or nightmares) of living in Canada is the fact that we get all four seasons. Usually I’m all for winter wonderland, but with the extreme cold we have been getting in Central Canada recently (-42 degrees Celsius with the windchill – yup, you read that right), my skin has been taking a beating. Moisturized skin is a must for this time of the year. I have had a number of those cute little eos lip balms and love every one that I’ve tried (my fave is the mint one, I find it also gives you nice breath), however, I have never ventured into the Everyday Hand Lotions that they also sell. 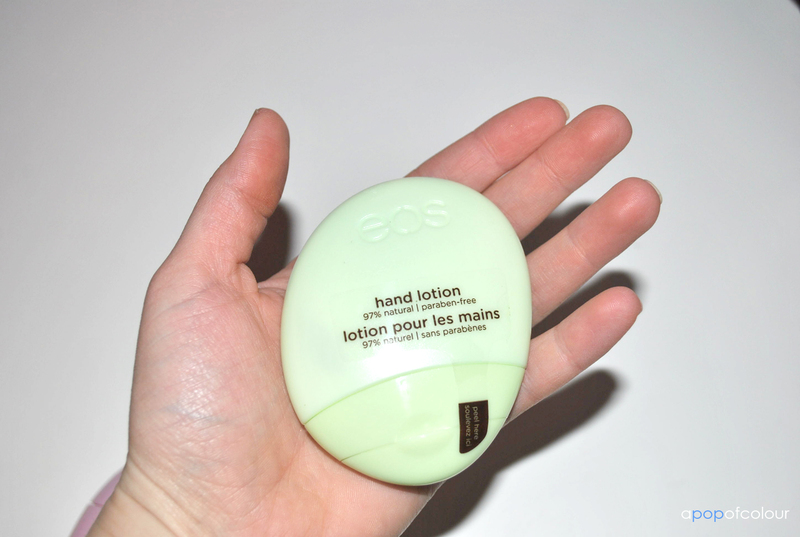 The eos Everyday Hand Lotions are packaged in a chic little ergonomic sphere that fits perfectly in the palm of your hand. You can throw it in your pocket, purse, or anywhere else handy because of the small, smooth, and thin bottle. It actually reminds me of a giant stone. I believe that the lotion comes in three scents, the everyday scent (not sure what this smells like, but it comes in a blue bottle), the cucumber scent (in a green bottle), and the berry blossom (in a pink bottle). Now what is so special about these? Well, aside from the fact that they provide moisture to chapped or dry hands (not to mention the irresistible packaging), they are 97 per cent natural and paraben-free, meaning that they won’t interfere with your hormones. Parabens are preservatives designed to make products last longer; however, when absorbed through the skin (as they often are) are bad for you. The eos hand lotions are enriched with nourishing shea butter, aloe, and oat extract. They are also hypoallergenic and gluten-free. 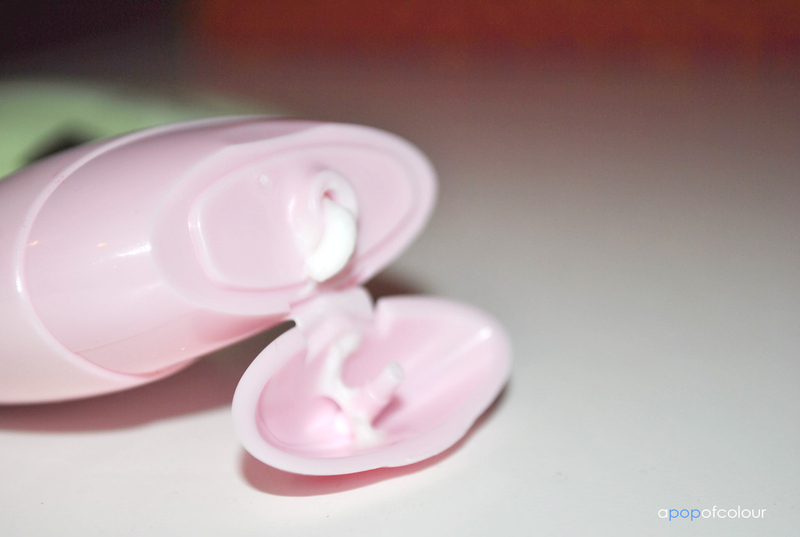 I’ve been keeping the berry blossom scented one (which is new to Canada as of January 2013) in my work bag and found that it’s a quick fix to dry hands. Because of the extreme cold happening right now where I live, my hands and cuticles have been dry, cracking, and sore, so therefore I love the portability of this product; I can take it everywhere. As for the scent, I prefer the berry blossom one more than cucumber (which smells like honey dew, of which I am not a fan), however, that is more personal preference. I have noticed that, although they do smell delightful, they aren’t overpowering like the Bath and Body Works body lotions. The scent is very subtle. I have been enjoying these lotions and although I don’t think they would help your hands in the long run, they are a quick fix (just like the eos lip balms). Plus, the ergonomic design of the packaging is just so cute, so I love carrying this around everywhere I go. The eos hand lotions retails for C$3.99 (a steal!) and are available at Rexall, Loblaw’s, John Coutu, London Drug, and Indigo. 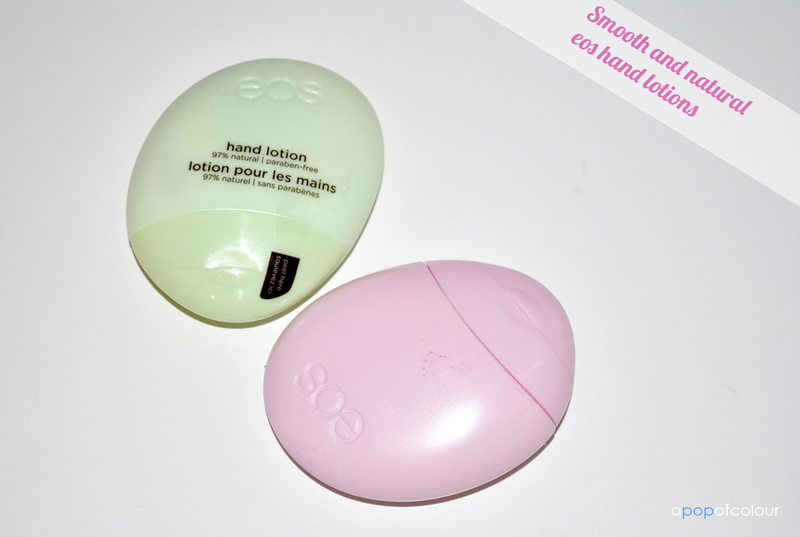 Have you tried the eos hand lotions? What are your thoughts? Please note I was sent these products for review purchases, however, all opinions are my own.